If you are planning to start a PCD Pharma franchise and looking the professional PCD Pharma companies for franchise in India then don’t look further, here we have prepared a list of top GMP, WHO and ISO certified companies which are offering Pharma franchise opportunity on Monopoly basis across Pan India locations. Progressive life care is one of the leading pharma franchise companies in India, It’s a Gujarat based ISO, WHO and GMP certified Pharma company providing PCD franchise monopoly rights across India. Fossil Remedies is a manufacturers and marketers of pharmaceutical formulations such as Tablets, Capsules, Injections, and Syrups etc. All the products manufactures under the WHO and GMP production. Mathis Pharma is Chandigarh based fastest growing Pharmaceutical company, they have 200+ DCGI approved Pharma products and prepared under the WHO and GMP norms. Apart from India they are also offering their services in Nepal and Thailand. Soinsvie Pharmacia is a renowned Pharmaceutical company expertise in Pharmaceutical products manufacturing and marketing, all kind of pharmaceutical products are manufactured under the ISO standard guidelines. Monark Biocare is a Chandigarh based Pharmaceutical Company established in 2011, they are engaged in supplying and marketing wide range of pharmaceutical formulations such as Tablets, Capsules, Injections, Suspensions, Syrups and many more. Ventus Pharma established in 2009 in Chandigarh, It’s an ISO certified Pharma Company offering wide range of pharmaceutical and neutraceutical products at competitive rates. H & I critical care is an ISO 9001 certified pharmaceutical company having super specialty pharma products prepared under WHO certified plants. Their specialty range includes Azetreonam, Meropenam, Teicoplanin, Netilmycin, Tigycycline, Anti-snake, Vancomiycin, Venom sera, Anti-rabies, Iron sucrose and many more. Alna Biotech is one of the fastest growing pharmaceutical companies in north India, their expertise in supplying, manufacturing and exporting wide range of pharmaceutical products like as tables, injections, capsules, suspensions etc. Fedly healthcare is the trusted name in the Indian pharmaceutical industry, they are leading manufacturer and trader of the health care products offers their service from last 5 years. Dr. Kumar’s Pharmaceuticals is one of the leading third party manufacturers of pharmaceutical drugs in India. Head quartered in Chandigarh, they are offering high quality pharmaceutical products at economical price. 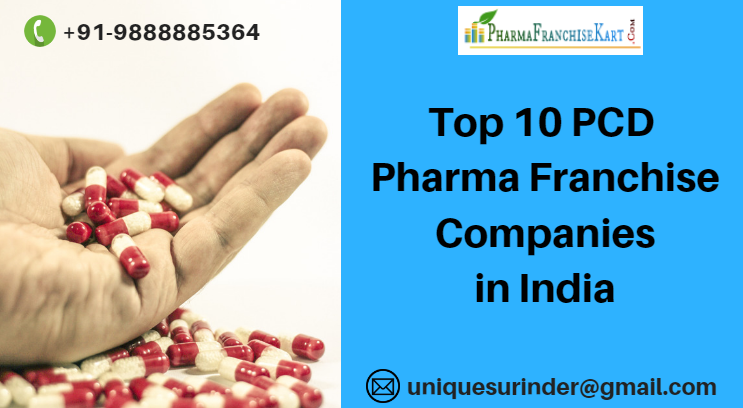 Finally you have got a list of top 10 PCD pharma franchise companies of India, Now is your turn make a call at +91-9888885364 to a get PCD pharma franchise.